For a long time I’ve been all about some Pathogen and Powerline. The former gave me decent plugin management (of which I had about 20), and Powerline is a Python-based status bar for Vim, which gives a nice…well, status bar at the bottom of your files. But I just redid my laptop and my Vim config along with it. I’ve been waiting to do it for a long time. Moved to Vim 8.x (compiled from source since Homebrew don’t play that). Moved to the new (Vim 8.x) native plugin management. Changed my status bar to Vim-Airline. 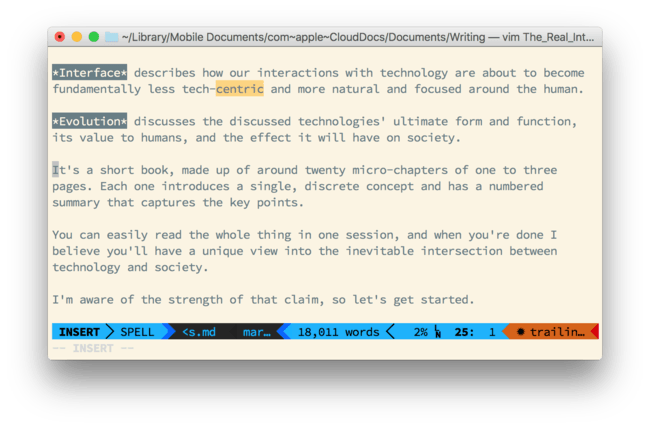 Changed my terminal font to Source Code Powerline (part of a family of fonts that look absolutely sick in cli interfaces). The post I used to set up my new plugin structure is here (love the typography on that site by the way), and then it was just a matter of spending 5 hours messing with options. 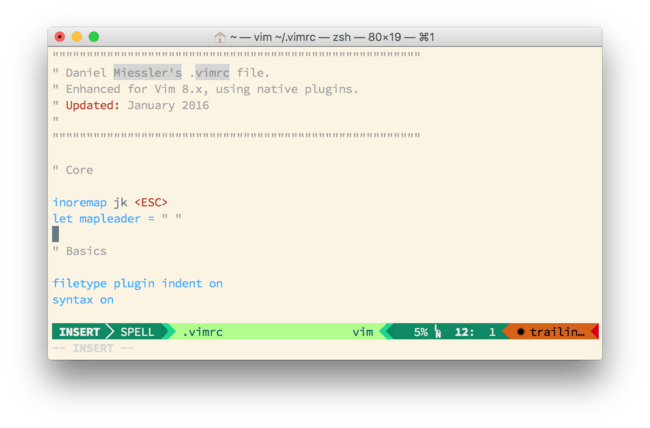 I’ve gone from ~20 Vim plugins to around 5, and I’ll be doing a separate post on which those are and what I like about them. I also have on my list to go line by line through my .vimrc file and eliminate anything I no longer remember, understand, or care about. The game for me is having a trim, optimized, and super-efficient Vim setup that makes me happy inside. And every few years I have to go through this process to get there again. If you’re a Vim nerd as well, hit me up and we’ll swap configs.